It was Marcel Ruijters who introduced me to Musique Concrete. 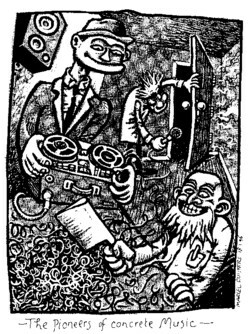 He gave me a tape of an LP by Pierre Schaeffer and Pierre Henry, that he had found in the library of the art school where he studied. I tried to find the tape, but I have no idea where I left it. 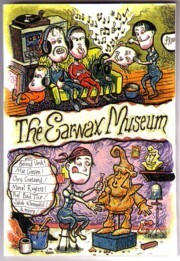 I did find a zine, The Earwax Museum, that Marcel published in those days, with a cartoon about the pioneers of Concrete Music. In those days my musical menu mainly consisted of soul and rockabilly, so this tape with musical experiments by the two Pierres was a surprise to me. But although I didn’t have a clue what I was listening too, I liked it very much. I thought it was a joke, but later I learned that these people took there work very serious. I have spend many pleasant evenings listening to Concrete Music and reading the theories behind it. Over the years my ideas have shifted into their direction. I have not much Concrete Music on vinyl; most of what I have (if I can find it…) is on tapes, and I have a few CD’s. As you probably know, the original records are rare and expensive. Here is a track by Luc Ferrari, who was part of the Group for Musical Research, lead by Pierre Schaeffer. 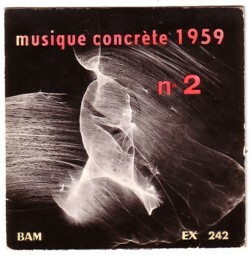 It comes from an E.P., Music Concrete 1959 No. 2 , that was released on the French BAM label.